It was in March 1897 that seven women met in the Telegraph Chambers in Adelaide Street, Brisbane and formed the Queensland Braille Writing Association (QBWA). The group included Mrs Sharp who was the Head Teacher at the School for the Blind and Lady Lamington, the wife of the then Governor of Queensland. Each of the seven undertook to braille twelve texts each, and thus began the work of creating a Library of braille books. Teaching blind, vision impaired and sighted people to read and write braille soon followed. Two years later on the 22nd March 1899 a free lending library was officially opened. Starting with just 54 books the number of texts grew considerably over the ensuing years. Some members of the Association brailled over a thousand volumes each and whilst some of them would have had access to a Stainsby or Perkins braille machine, much of the work would have been manual, dot by dot, using a frame and stylus. Millions of dots and half a century later QBWA found the property that it still calls home at 507 Ipswich Road, Annerley in Brisbane. Over that time which of course included two World Wars and The Depression QBWA occupied various rented rooms including the original meeting place in the Telegraph Building and the basement of 247 Vulture Street, South Brisbane. Mr R F Tunley, well known to blind and vision impaired children and adults of the time as Grandfather Tunley voiced the thought that QBWA really needed a permanent home for its ever-growing library of braille books. And even more needed was a place for meetings, classes and many other activities of this totally voluntary and busy organisation. Fundraising began in 1952 with the South Brisbane Rotary club making it their project for the year. An Entertainment Committee was formed within the Association and the concerts, bridge parties and fetes began. It was one of the helpful Rotarians who suggested that a certain property on Ipswich Road at Annerley might be suitable. A big old Queenslander (the house, not the Rotarian although history does not tell us much about him), in good condition and with enough land to allow for expansion it had, coincidentally, originally belonged to the family of Mrs Brennan, one of the transcribers. Mrs Brennan’s daughters also became volunteers at QBWA. 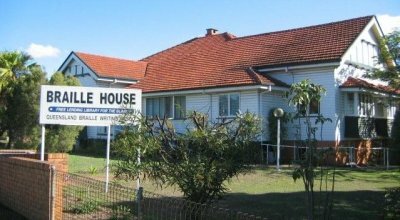 The property was purchased for £6,000 on the 9th June 1954 and once again with the help of South Brisbane Rotarians and some local Boy Scouts the big move was made. The Official Opening was performed a week later on the 17th June by Lady Lavarack, the wife of the then governor of Queensland. In 1954 Braille House (as it came to be known) comprised only the original house. By the end of the 1950’s plans were being made for the first of three expansions. The north wall was pushed out to make the main room much larger, and the area under the house was excavated to enable building additional workrooms and a fireproof library. Once again the good Mr Tunley had been instrumental in raising the necessary funds for the expansion. 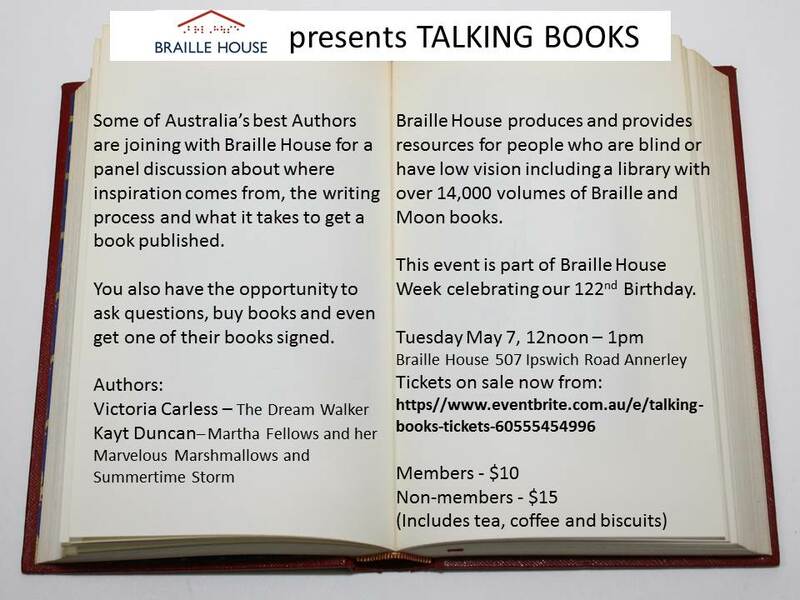 Then on the 29th August 1970 the Marjorie Taylor Wing was opened to house the thousands of volumes of braille and moon books that comprised the Library. And on the 24th February 1986 the Madeline Bird Wing was officially opened. That extension of Braille House required the acquisition of a neighbouring property enabling QBWA direct access from each of the two side streets off Ipswich Road. The wing now houses the Library despatch office, the Tutoring Room, the Magazine Room (where embossing machines have long since taken over from manual methods of producing braille), and the Caretaker’s flat. 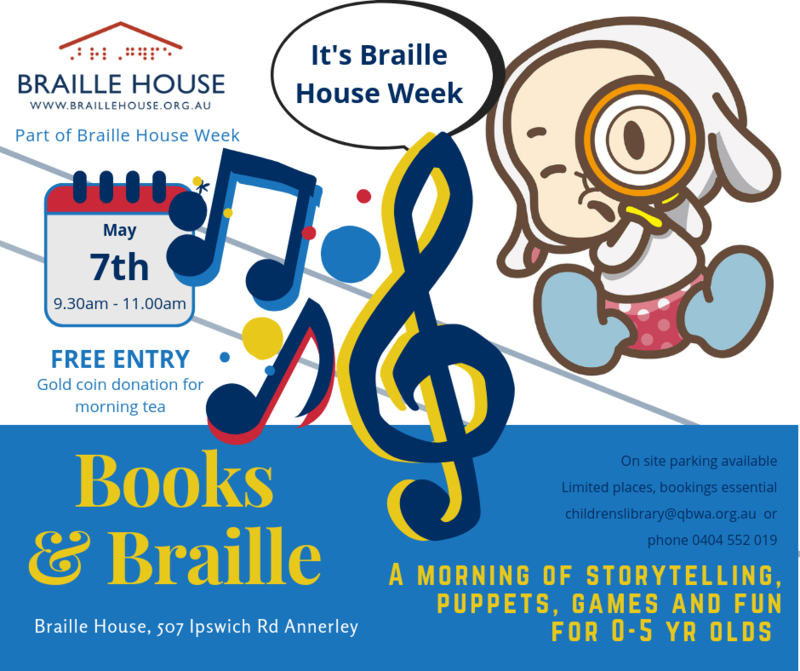 Braille continues to be the primary means of tactual literacy for people who are blind or have low vision, and Braille House continues to be the busy hub for the vibrant family of people who service the braille and moon needs of people around Queensland and beyond.